New Year's Eve is a good time to reflect back on the past year and going through some of our favorite entertainment pastimes. 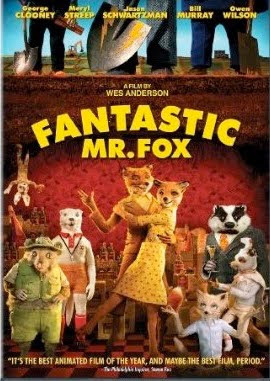 There's still a number of movies, albums and books I want to check out but here are some of my favorites of those that I DISCOVERED in 2009 (as some of these came out before then) and in no particular order. 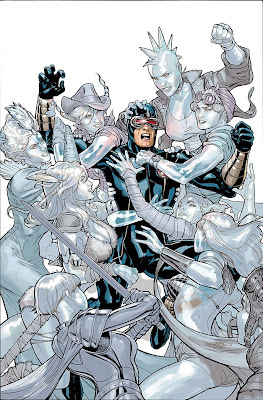 Uncanny X-Men #519 is out in stores this week. 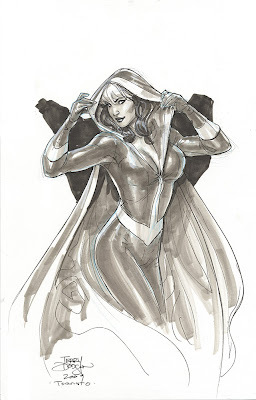 I will be posting up scans and an original art for sale list next week. So here's the final colors for Uncanny X-Men #520 which Greg Land drew the interiors for (Greg did the cover for my issue, #519, and so in return, I drew the cover for his issue). 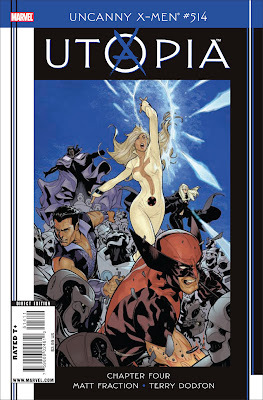 I also did the cover for the March issue, Uncanny X-Men #522, alas, I'm not drawing the story. 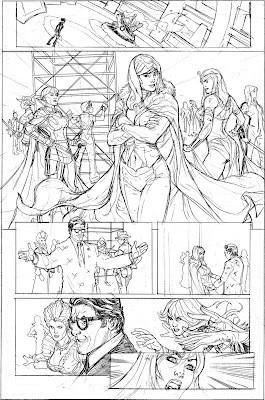 I return to the interiors with the April issue, Uncanny #523, which is part of the "Second Coming" crossover. 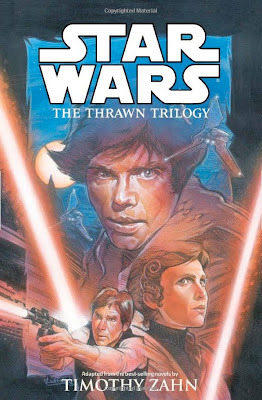 Dark Horse Comics has just released a new collection of "Star Wars The Thrawn Trilogy" which features all 3 miniseries (a total of 420 pages) with the first volume featuring the art of Olivier Vatine and Fred Blanchard, the 3rd volume the late great Edvin Biukovic and the middle volume with art by me and Kevin Nowlan and under theepic covers of Mathieu Lauffrey. I'm a life long Star Wars fan and I took a year off from Marvel Comics for the chance to draw this miniseries. It was a really labor of love for me and I was very happy with how with how it turned out. 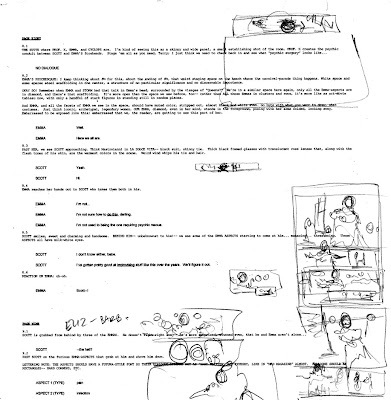 So, here's Matt Fractions page description with my thumbnail sketches all over it. 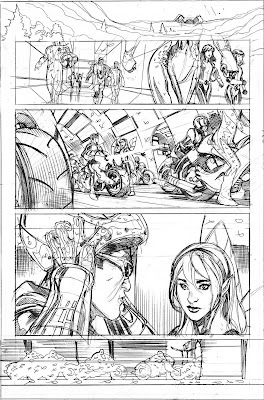 I had a pretty good idea of how this page would look - just a matter of which way to tilt some of the panels. 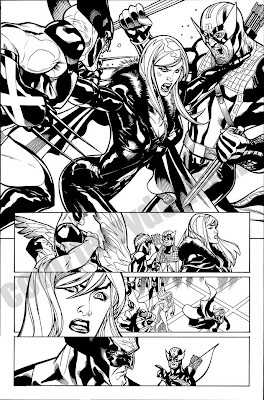 Next is the partially finished page where I'm trying to nail down Emma's facial expression. 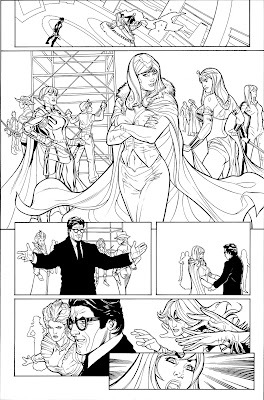 Matt wanted to go with a Fellini feel to this - thus the 8 1/2 scaffolding in the background of panel 2 and Scott's Marcello Mastroianni inspired hair, glasses and suit. It was a fun change. 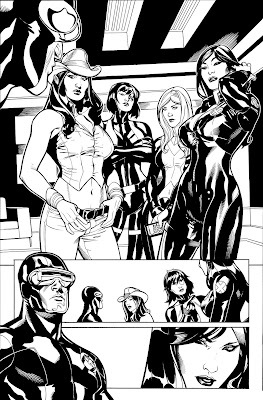 and in the Store of terrydodsonart.com. 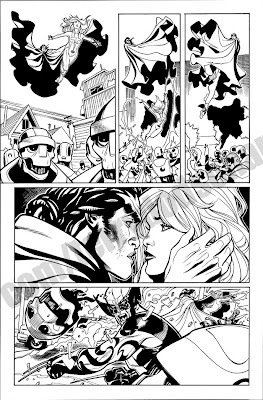 All originals are black and white ink illustrations on 11 x17" bristol board (except the cover (13x19" bristol)). to check on availability/reservation of page. 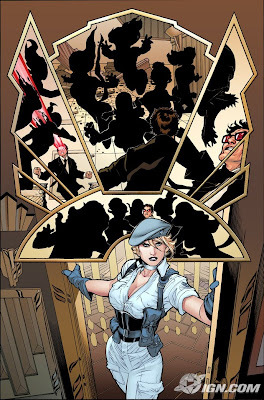 Here's a look at the pencils, inks (by Rachel) and colors (by Justin Ponsor). 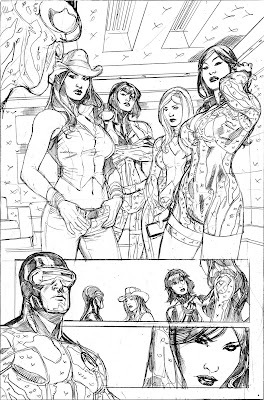 I will be posting up some more pages plus a list of original artwork for sale soon. So, here's the final art - this was done on a Mac Pro, using Photoshop CS3 and a Wacom Intuos Graphics Tablet (6 x 8"). 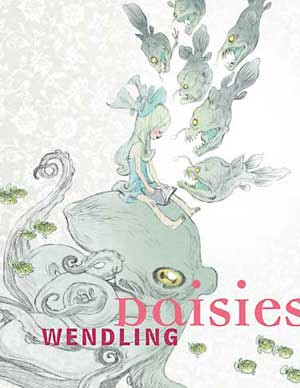 This issue ships in December. 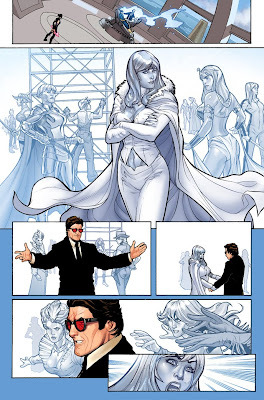 This is a pretty straightforward talking page with the focus on Cyclops and Pixie - the trick was creating a page showing all the numerous X-Men and not spending forever drawing them all - as we only needed to know that they were in the scene not the focus. 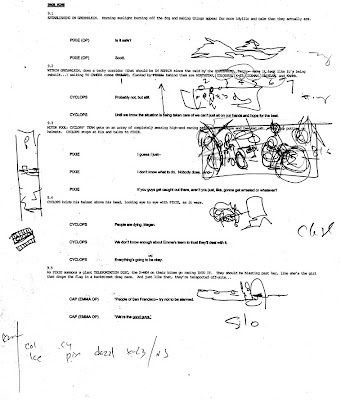 The bikes were fun to draw - I used a version of the bikes I drew the X-Men drawing in one panel of Uncanny X-Men 500. 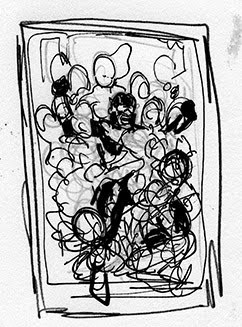 OK, so here is the Matt Fraction page description and my little thumbnail sketch of the page. 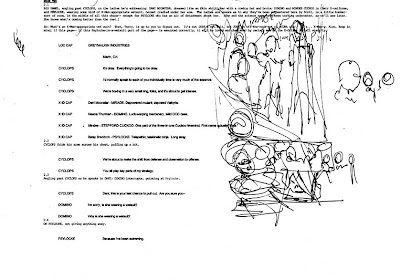 I had a pretty good idea of what this page would look like based on the description and so stuck pretty close to my initial sketch. 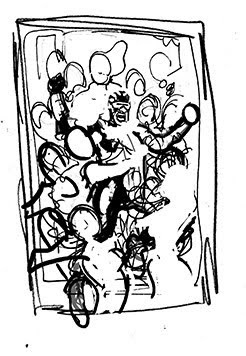 So I went through and drew all the figures first with the perspectives roughed in and then finished up the backgrounds last. 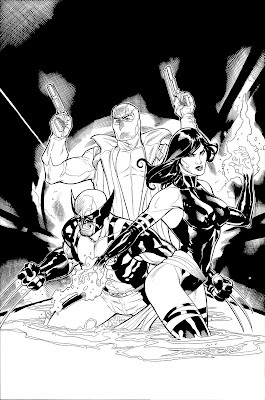 I had to draw Psylocke in a new "X-Men" wetsuit. 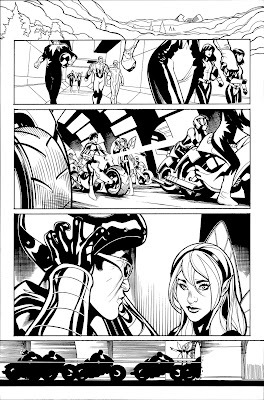 After I drew her in the pencil stage with an open leg suit - I decided if she was going to be in the SF Bay she would need a full body suit so I added that before Rachel inked the page. 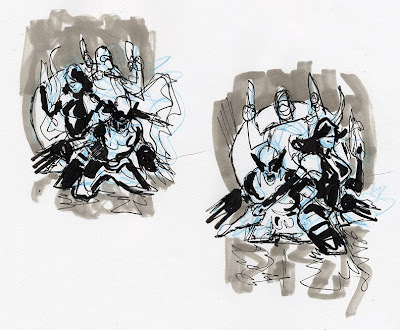 The top drawing is the scan from sketchbook that is about 6 x 7" inches drawn with blue pencil and markers. 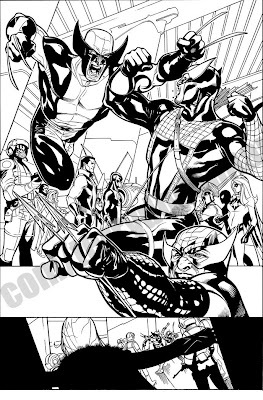 The 2nd drawing is the cleaned up "photoshop-ed" (CS3) version I sent in to Marvel for approval. 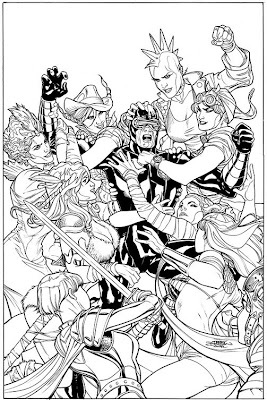 Ok, here's Rachel's inks for the cover. 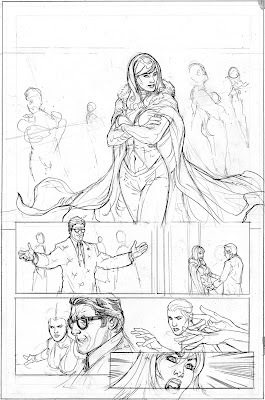 Rachel inked directly over my pencils with a Windsor Newton Series 7 Size 2 Kolinsky Sable Brush, FW Acrylic Black Ink and Pro White and then erased the piece with a Grande White Eraser. 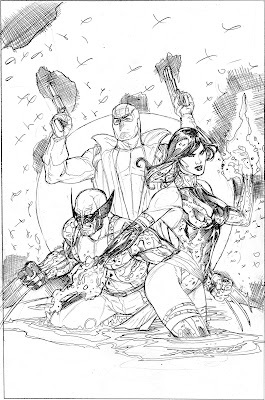 So here's the pencil version of the cover. It was drawn on 13 x 19" 3 ply Strathmore Bristol Board with a Prismacolor Col-Erase Light Blue Pencil and a Staedtler HB Lead Holder. 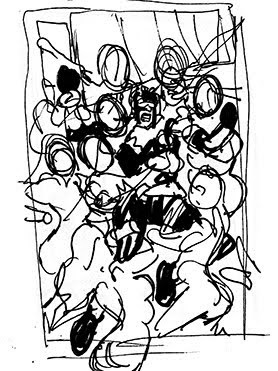 After this was scanned, I redrew Wolverine's face (as it seemed too small) and added a more detail in the background (to give you more of the feel of a New York Subway and more of lighting/atmosphere) which you will see in the inked version. 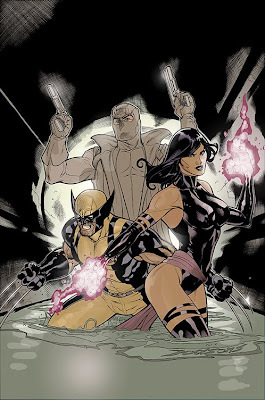 Here's the solicited version of the cover art for the January issue of Uncanny X-Men. 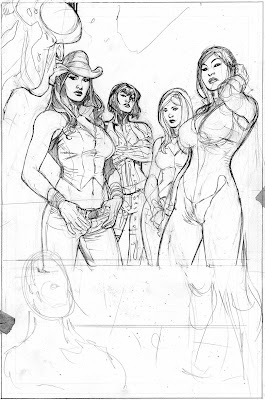 I will post up the pencils and inks plus the final version of the colors. 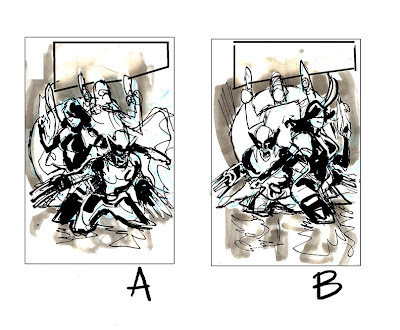 Ok, so here's my process for developing an approved cover sketch for the Uncanny X-Men 518 cover. 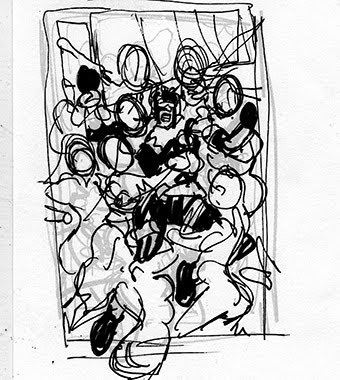 The first drawing is a 4x 5" sketch done in my sketchbook with blue pencil, and a black Pitt pen. 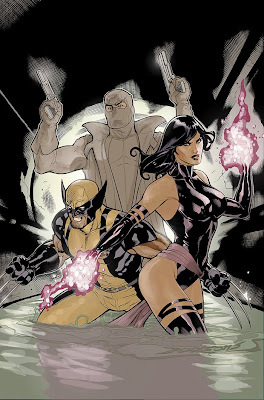 The final color sketch is the result of drawing and coloring in PS and getting the cover proportions dead on. 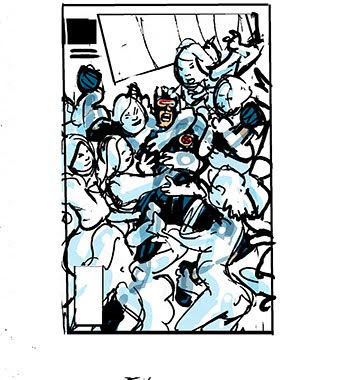 This is the version that is sent off to Marvel for approval. You can see how it turned out from there below! 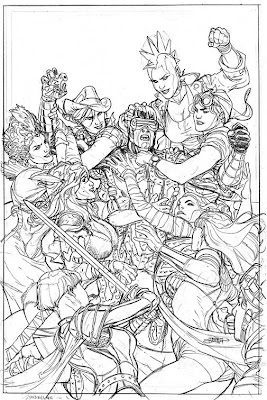 Here's my pencils and Rachel's inks for this cover. The artwork is done on 13 x 19" Strathmore 500 Series 2 Ply Bristol Board and the tools are the standard ones. 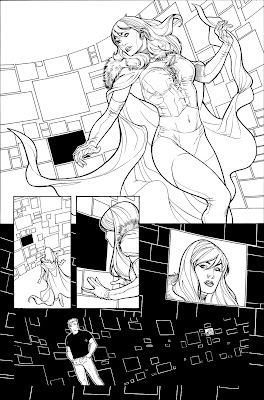 As I mentioned before I will post the final colors for this (as soon as I'm happy with them!). Here's the solicited (not final) colors for the cover. 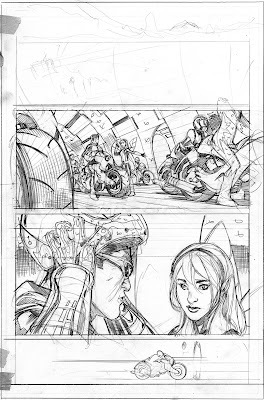 I will post the pencils and inks as well. 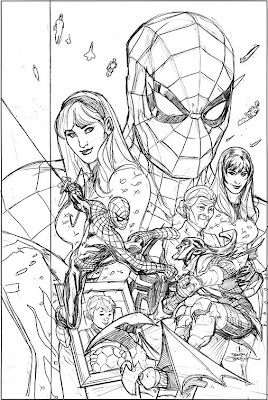 This is the cover for the What If House of M/Spider-Man coming out in December. I only did the pencils - it is being computer painted by someone else. However, Rachel is inking it for fun now, I'll post that up when she finishes it up! 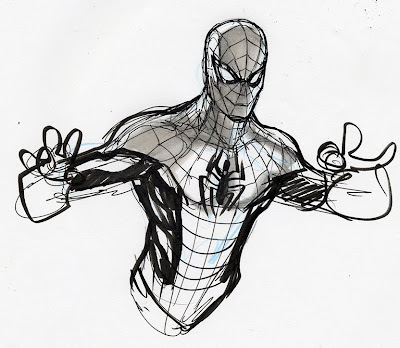 Remember that Spidey sketch from about a month ago? Here's a little sneak peek at how I ended up utilizing it! More to come! Hey, I got a bunch of sketches to post up but have been too busy with work to get around to it - however, here is one to hold you over. I will post more pics, etc, but I'm back a day late and my bag, a day later! 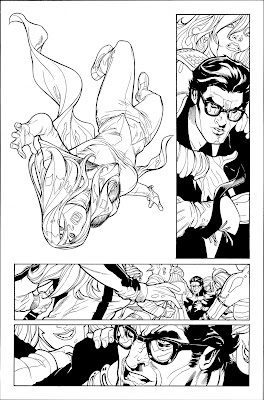 Here's a little Spidey action to hold you over! 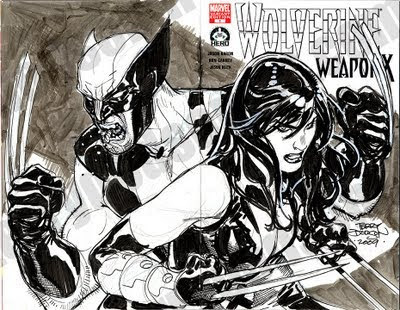 I "should" be at my table (P31) in Artists Alley at 4pm on Friday to start taking a commission list before the Sketch Duel at 5pm and hopefully back to the table between 7-8 PM before my final signing at Marvel at 8-9pm. 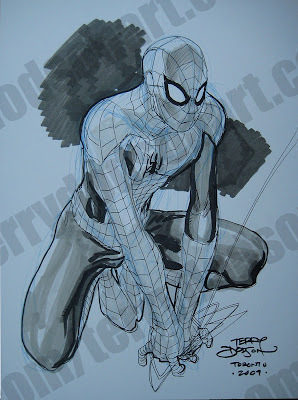 I will be sketching at my table in Artist's Alley as well. 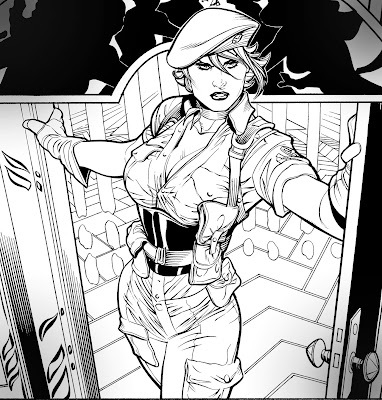 Plus, I will be bringing original art and Bombshells Vol. 4 Sketchbooks to sell. 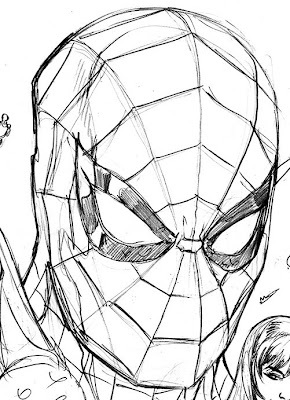 Here's a little Spidey sketch I did as a prelim for a cover I'm working on. to check on availability/reserve a page. The book ships next Wednesday, the 14th.